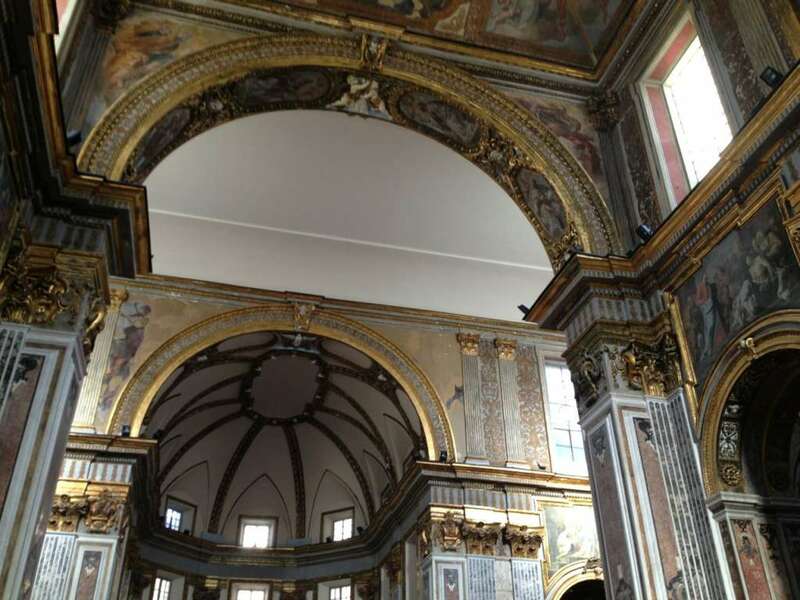 We visited San Pietro a Majella, featuring frescos by Mattia Preti. 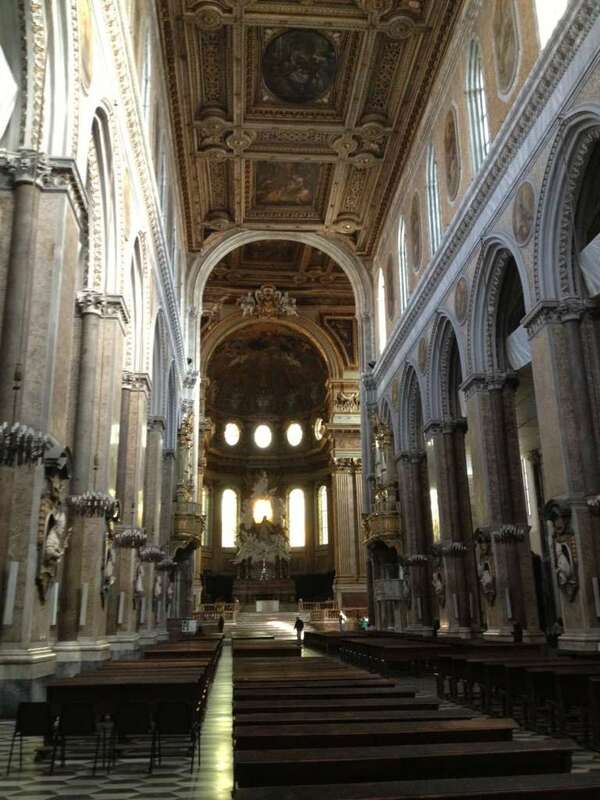 From there, we walked to the incredible San Paolo Maggiore, an especially beautiful church which sadly suffered great damage during Allied bombing in World War II. 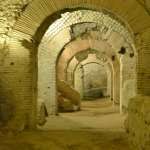 The church is built on the ruins of a 1st century temple; so much of Naples is just layers upon layers of history such as here. 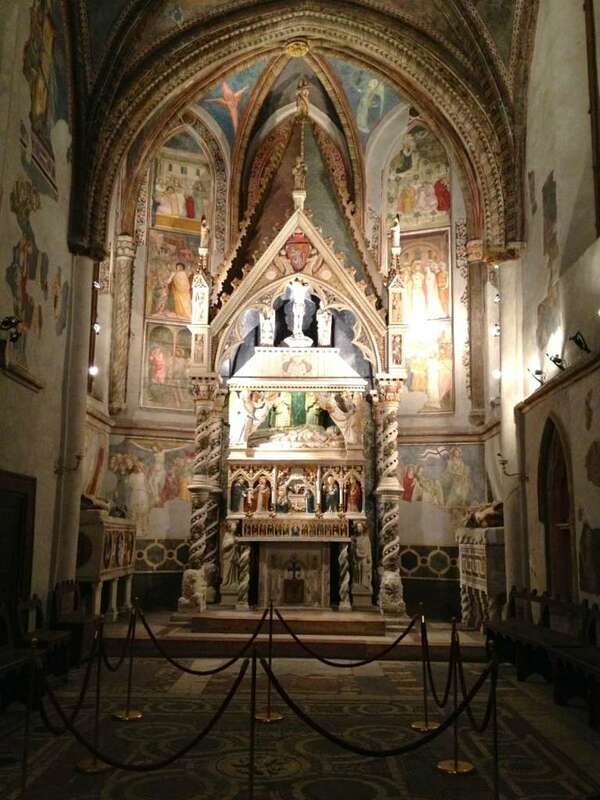 While many frescoes were lost, what still remains are the beautiful marble artistry and sense of splendor. San Paolo Maggiore: blank walls and ceilings which once were covered with fresco painting and marble. Next, we visited the actual monastery and church of San Gregorio Armeno, one of the most important baroque buildings in all of Naples. 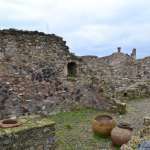 Once again, it is a church built over the ruins of a Roman temple, in this case by a group of nuns escaping persecution and carrying with them relics of St. Gregory. It was one of our first tastes of Luca Giordano‘s art legacy and importance in Naples as well. Next? Pio Monte della Misericordia, home to the first of the three Caravaggio paintings in Naples (and we would see them all before our week was done): the incredible Seven Works of Mercy, which may be my favorite of all of Caravaggio’s paintings for its complexity, detail, realism and expression. 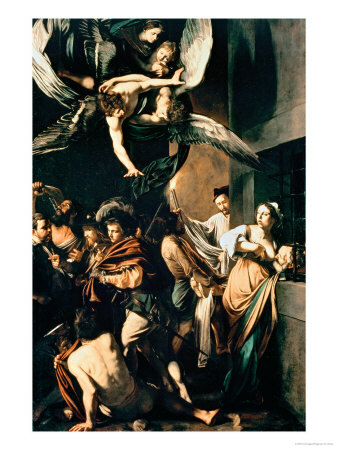 This painting, in many ways, is Napoli and feels as potent and timely today as it surely did when first painted in 1607. After visiting the small church, we took in a quick visit to their museum of Neapolitan art before making an equally brief visit to the Duomo di Napoli—we would have to come back for more later. We took a brief lunch break at one of the many bar/cafes in Piazza Bellini, much quieter and pleasant during the day than at night when the college crowd descends. Just a few basic but tasty paninis and a little wine to rest up before deciding what to do with our afternoon. 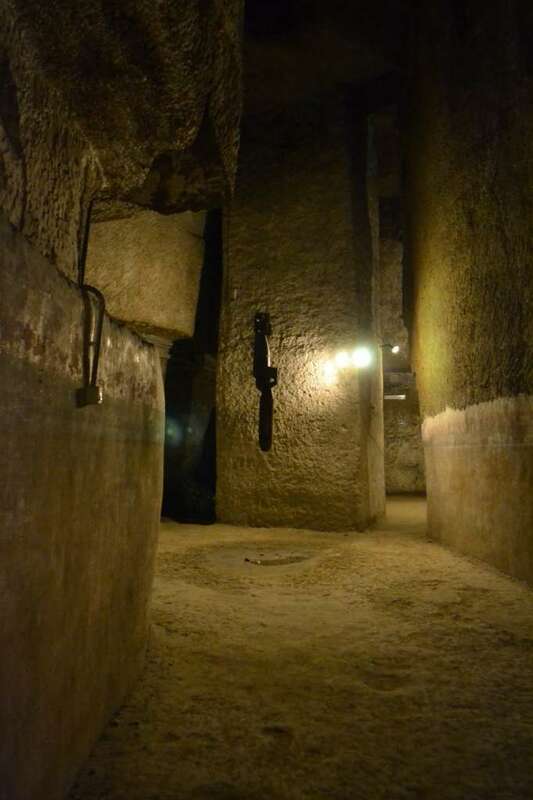 What looked most promising was Napoli Sotterranea: a tour of underground Naples that would take us back over 2400 years to the founding of the city, ancient waterways, secret passages for nuns making wine (that they could blame pregnancies on, because it must be divine intervention! 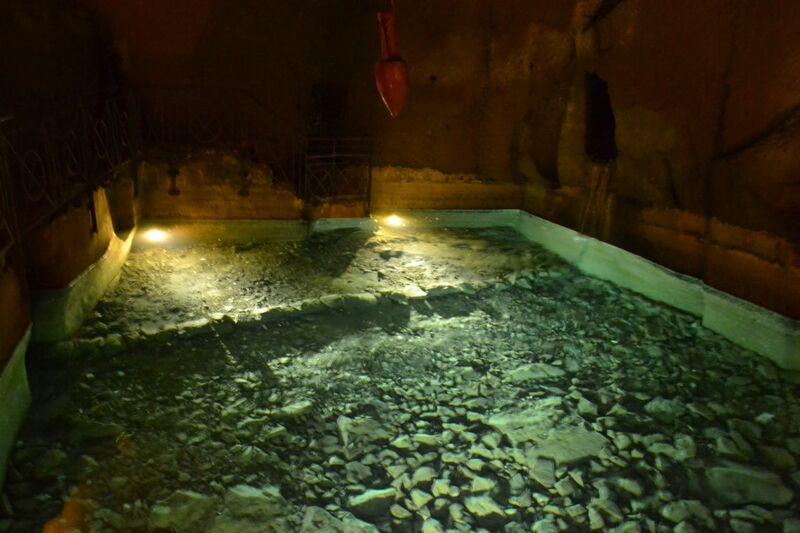 ), bomb shelters during World War II, and Roman theaters that were discovered in modern apartment basements. Naples Underground…complete with Allied bombs which fell down a well and somehow did not go off. The tour was wonderful, and filled about a good two hours’ time…well worth it! It was just past dusk when we were finished, so we started thinking about what to do with the evening ahead. Since we were near the Duomo, we decided to go back and spend a little more time exploring the church—which was a great idea. We were greeted by a gentleman who asked if we’d like a guided tour of the church, and since we didn’t know a whole lot about its history we said, why not? He ended up being an excellent guide who knew all about the artwork throughout the church (including the beautiful Minutolo Chapel and its 14th century frescoes…perhaps by Giotto? Well, if not, his influence is keenly observed in their style and coloration.). We visited the Crypt, the Baptistery, and of course the Royal Chapel of the Treasure of San Gennaro—dedicated to the patron saint of Naples. All in all we must have spent about an hour in the Duomo, there was so much to see. 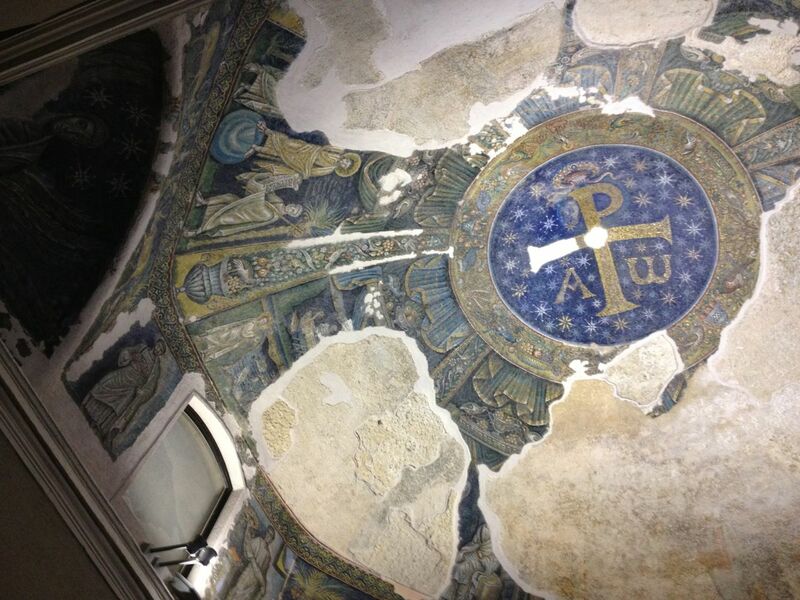 The 4th century mosaic ceiling in the Duomo’s baptistery—the oldest baptistery in the Western world. Sweetie mentioned taking a walk along the Bay, but couldn’t remember, from his visit many years (decades?) before, where the best place to start our walk would be. 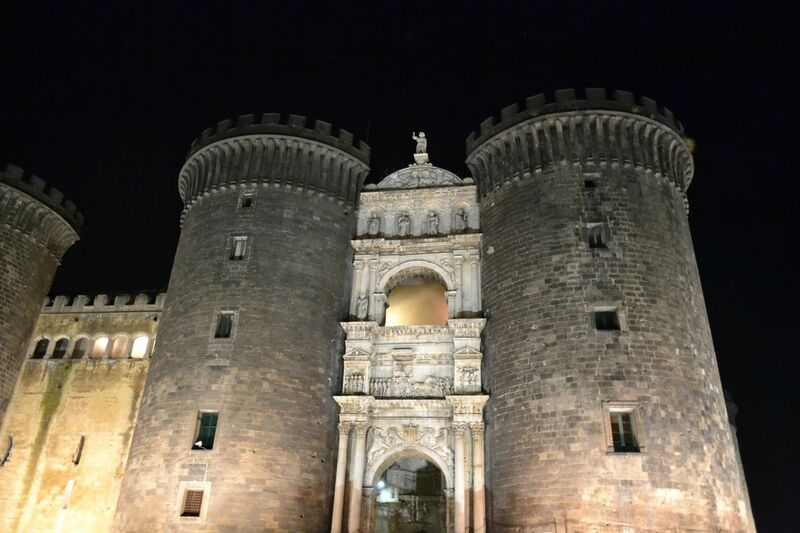 His first guess was near Castel Nuovo, which was at least cool to see at night. But an easy, clear walking path from there to the Bay? Not as easy to find as we thought. We ended up going down a sloping, dark road (past a urinating drunk) to find ourselves along a busy motorway. But we did then find a pedestrian path through the Giardini del Molosiglio, up a sloping road, and then finally along the Bay. Here at last too were a row of fancy, high-end hotels: some done up with a Christmas tree on every single room balcony! One thing worth noting: being perhaps the most “touristy” part of Naples, we were annoyed several times along this walk by the most pushy rose peddlers I have ever encountered in Italy. These guys would seriously not leave us alone and would tag along behind practically demanding to be given 2 Euros for a rose—whether you wanted one or not! I’m sure lots of people get nervous and just give in, but a curt and loudly-spoken “Basta!” was enough to get them to finally back off and leave us alone. 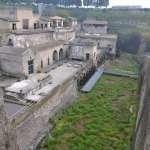 We walked along until we came to a pier and the other major castle upon the water in Naples, Castel dell’Ovo. 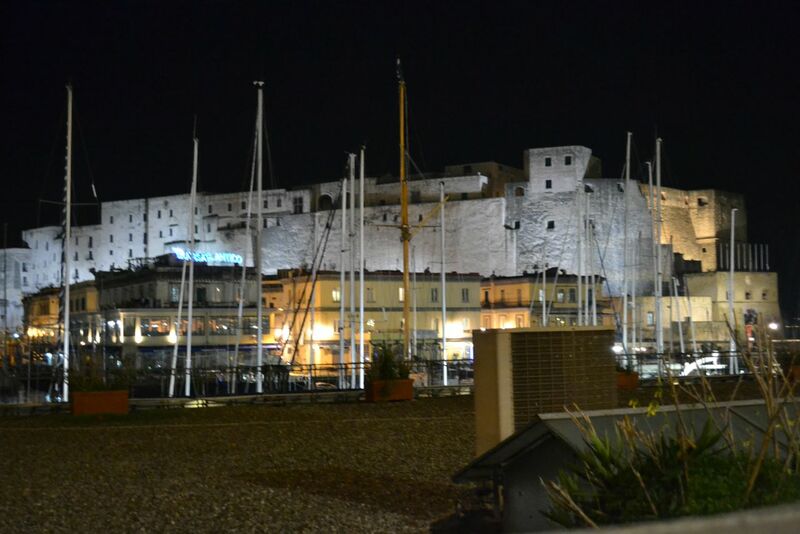 Around the castle is the Borgo Marinaro: once a small fishing village, now a quaint if touristy marina with lots of restaurants and cafes. Half of the restaurants were closed for the season when we were there, the other half largely desperate to drag in any passing tourist with promises of the best fresh seafood, the best pizza, “free wine”, etc. I’m always leery of any restaurant that has to try too hard to lure in customers, so I did some quick searching on FourSquare and TripAdvisor for recommendations on which places were actually decent. 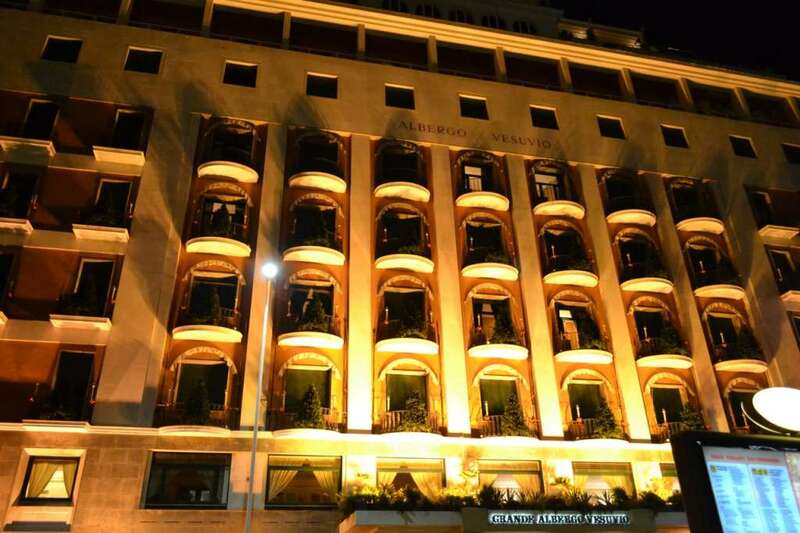 We ended up deciding to give Ristorante O’ Chiaiese a try. We were seated in their “outdoor” dining room, which was wrapped up in plastic sheeting for the winter; a nearby heat lamp was definitely appreciated to keep away the evening chill. The menu at O’Chiaiese of course was focused on seafood with also a number of pizza offerings for good measure. 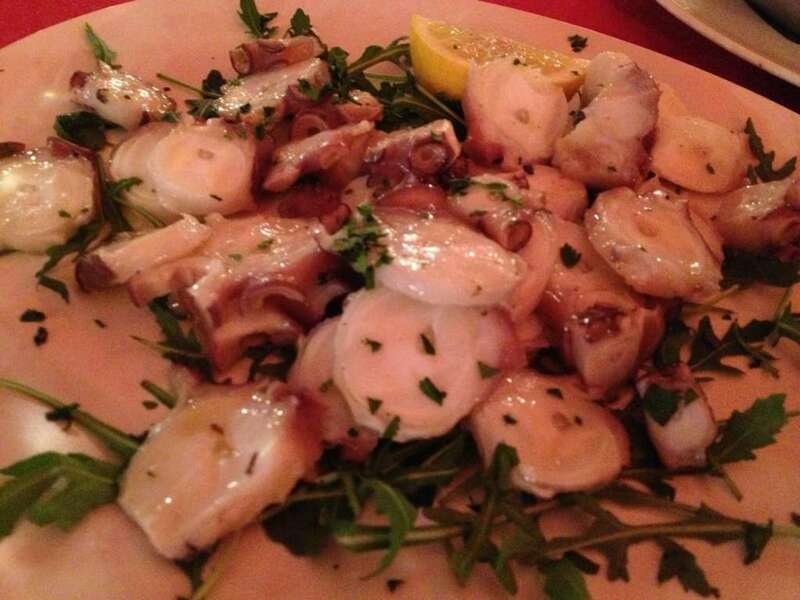 We started with marinated, grilled octopus and also sauteed mussels and clams. The octopus was very tasty and clearly fresh, but a little tough; as it was larger pieces it could have perhaps benefited from some slow-cooking first before finishing on the grill? 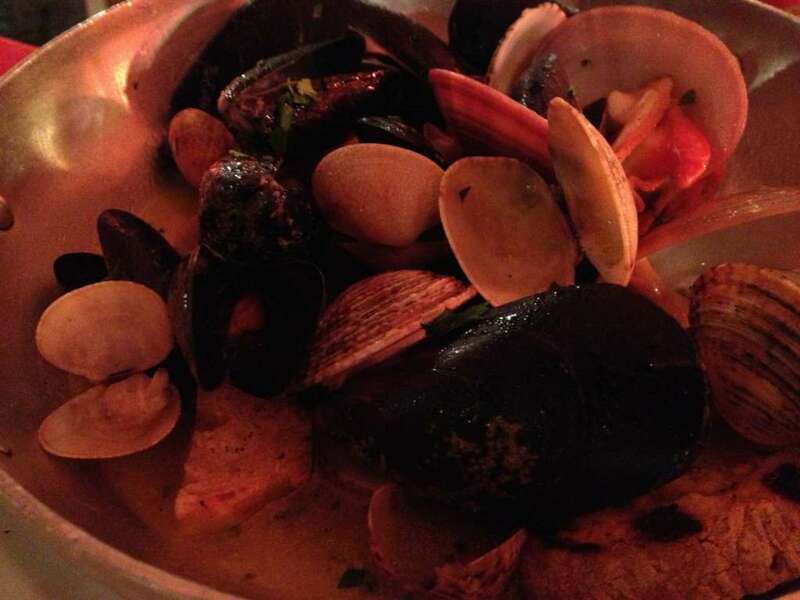 On the other hand, the mussels and clams were wonderful. There was a mixture of different clams included and the wine-based broth was addictive, well worth mopping up and savoring with the crusty, grilled bread provided at the bottom of the bowl. 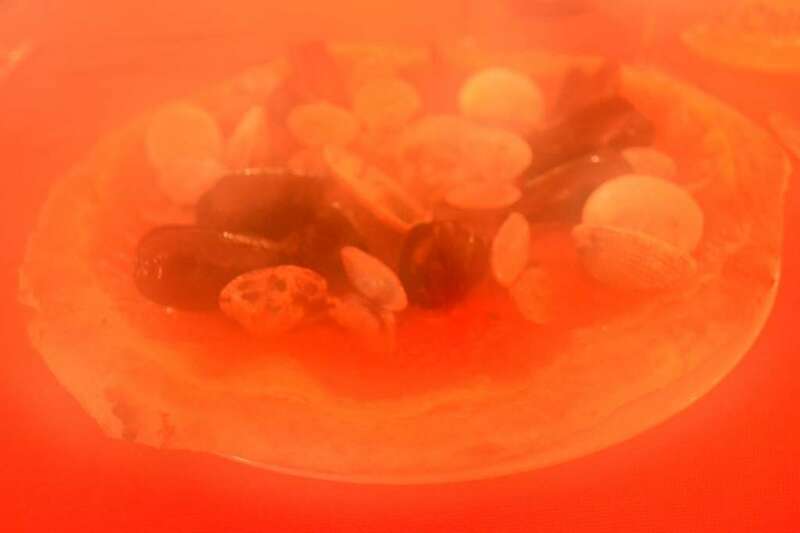 Seafood pizza…So hot and steamy it fogged over my camera! The pie was good, although it would have benefited from a few other kinds of shellfish on top instead of just more clams and mussels. 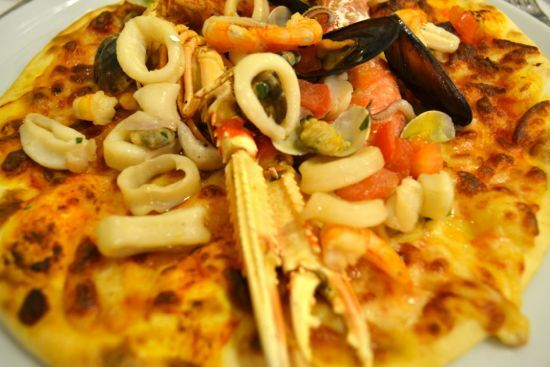 Truthfully I still give Venice the award for best seafood pizza in Italy…so far in my experience, at least. 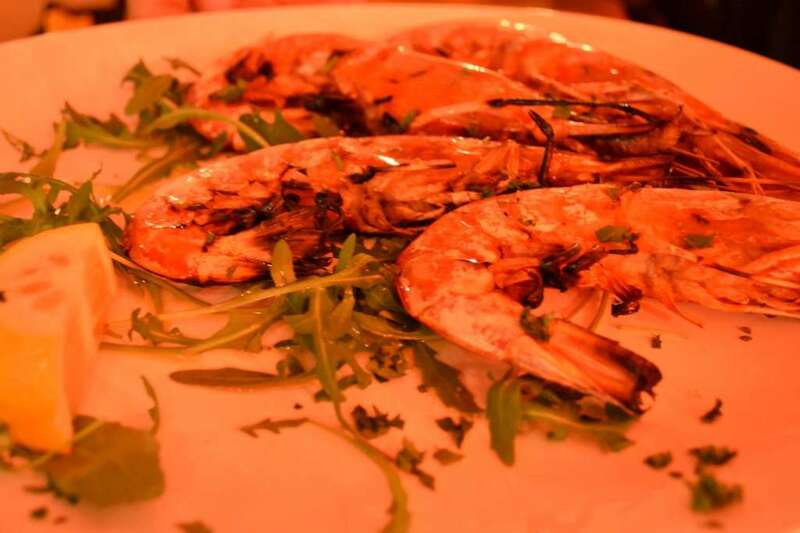 The grilled shrimp though were delicious, sweet, and cooked just right. 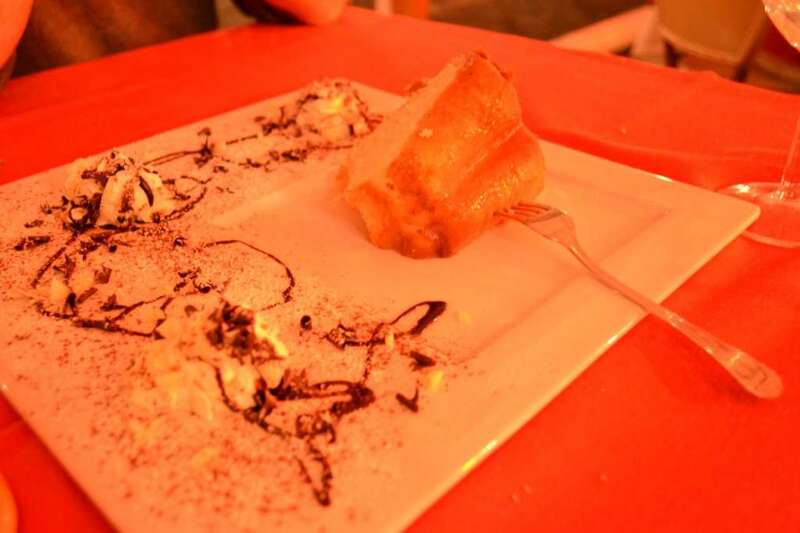 We finished the meal off with a shared slice of baba rum cake, which definitely was “liquored up” and actually a reasonably light finish to the meal. Overall it was a solid dinner, maybe not the best we would enjoy in Naples but satisfying enough, especially for the sauteed mussels and clams and the grilled shrimp. 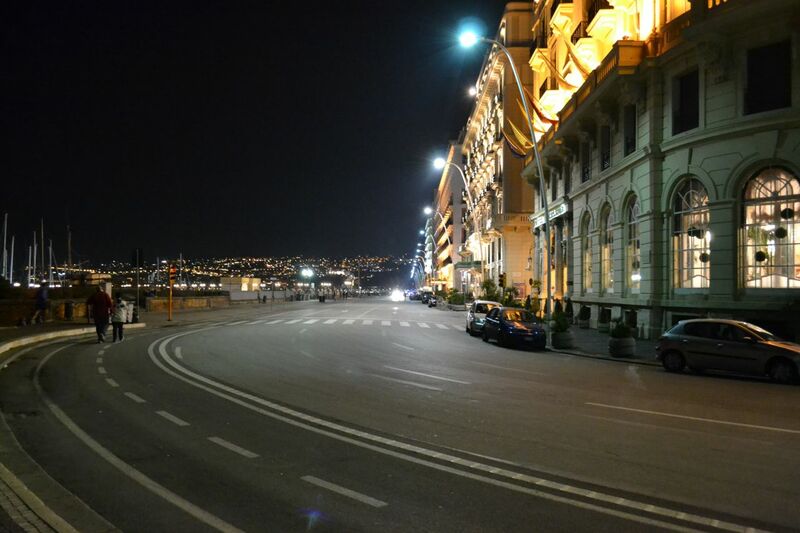 After dinner, we grabbed a taxi and headed back to our apartment—it had been more than a full day. 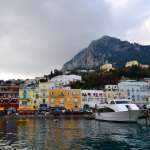 We also wanted to make plans and get up early the next morning, as we would be taking our first day-trip out of Naples: to the island of Capri! 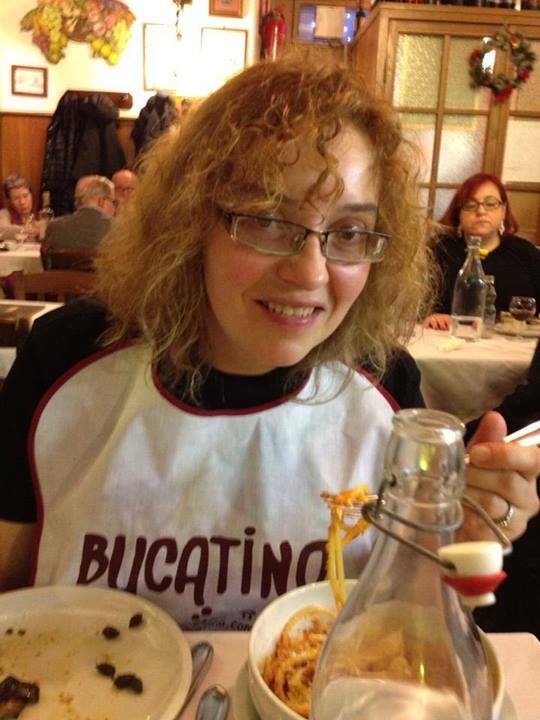 This entry was posted in Italy and tagged italy 2014, naples, pizza, restaurant review, Ristorante O' Chiaiese, seafood. Bookmark the permalink.